Serger 101. Learn to use a serger with confidence. Gain confidence using your serger with sewing instructor Margaret Smith. If you know the basics of serging, you'll now discover how versatile your machine is! 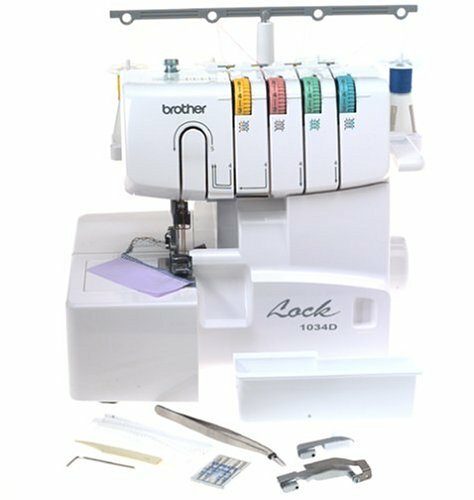 Begin with an overview of serger threading and maintenance. Then, learn how to create nine different types of basic stitches and create a serger stitch book you can reference again and again. For those tricky serger slip-ups, Margaret will show you how to troubleshoot common issues like poor tension, skipped stitches, fabric rippling and more. Now that you've refined your serging skills, put them to the test with three fun skill-building projects. Whether you adore or fear your serger – you will love this introductory serger online course! A serger is an invaluable tool to have in your sewing studio. It's fabulous for making garment construction quick and easy, and it can even add special decorative touches! Don't let all those threads intimidate you – your serger will be your new best friend. This course will teach you all you need to become fearlessly proficient in serging. The tools and techniques taught in class guide you through everything from threading basics, to serger garment construction – everything you need to know to use a serger with ease and confidence. Serger 101 will give you the opportunity to practice your serging skills and explore new ones as well. Learn to get the most out of your serger by building a strong foundation through Serger 101. A serger may not entirely replace a sewing machine – but you'll wonder how you ever sewed without one! No need to travel to a class or try to work around someone else's schedule. With our online workshops, you can watch the video lessons on your laptop, tablet or phone. Whenever you like, as many times as you like. Allow your favorite spot with internet access to become your classroom! This course follows the same format that I have used to teach hundreds of people how to sew in my studio, fabric stores and schools for over 15 years, it works! Q. HOW LONG DOES THE WORKSHOP TAKE TO COMPLETE? A. That’s up to you! The course is broken down into manageable, bite-size lessons that you can take at a pace that suits you. There’s no deadline, so you can fit it around your other commitments. And you can go back to the lessons any time you get stuck or feel like a refresher. Q. WHAT IF I BUY THE WORKSHOP AND THEN CHANGE MY MIND? A. Your purchase is backed by a 30 day no questions asked money-back guarantee. If the class is not what you expected, simply request a refund within the first 30 days. Q. WHAT IF I GET STUCK DURING THE WORKSHOP? A. Don't worry, I’ll be there to help and encourage you. Enrollment includes access to a private, students-only Facebook group to share your work and get feedback from me and your classmates from all over the world! If you're not on Facebook, you're free to contact me any time with questions. Margaret Smith is a professional seamstress and sewing instructor, who loves to teach others how to sew and improve their techniques. Margaret has worked with students from all over the world - students just like YOU who enjoy working with their hands and feel rejuvenated by a relaxing pastime that lets you really show off your creativity! Margaret has dedicated her life to sewing clothing and teaching others new techniques, and she specializes in helping beginners master difficult techniques with ease. Margaret's approach to teaching is practical, down-to-earth and encouraging – she loves sewing, and wants you to love it too!